When it comes to recipes, I try not to overuse the word “favorite.” But the truth is, I have lots of favorites. Whether it is a favorite color, number, season, or food, it is hard to pick just one! However, if I had to narrow my list of favorite salads down to a few truly prized recipes, this satisfying lentil salad with its savory vinaigrette would absolutely make the list. The only reason it has not made it to The Fountain Avenue Kitchen site until now is that I have been “saving” it. In some cases, there are terrific recipes that are regulars on my family’s dinner table that aren’t published here yet because I simply haven’t taken the picture and written the recipe. It may sound silly, but I always take great care in writing the recipes so that I, hopefully, troubleshoot for any questions people might have. I also like to give options so people feel free to be flexible and tailor recipes to their own needs and preferences wherever they can. And like any parent with with lots of balls in the air, I never get as much done in a day as I hope to! But the “saved” recipes happen when someone requests it for a particular purpose or I am using it for one of my columns. In this case, Keely, the editor of Susquehanna Style, chose it for a feature of winter salads. Susquehanna Style is a regional magazine I have long admired and to which I feel honored to now be a contributor. I have made this salad countless times, for my family, for potlucks and holiday parties–I even made it for the high school cross country team and their families and was shocked when the kids scraped every lentil from the bowl! 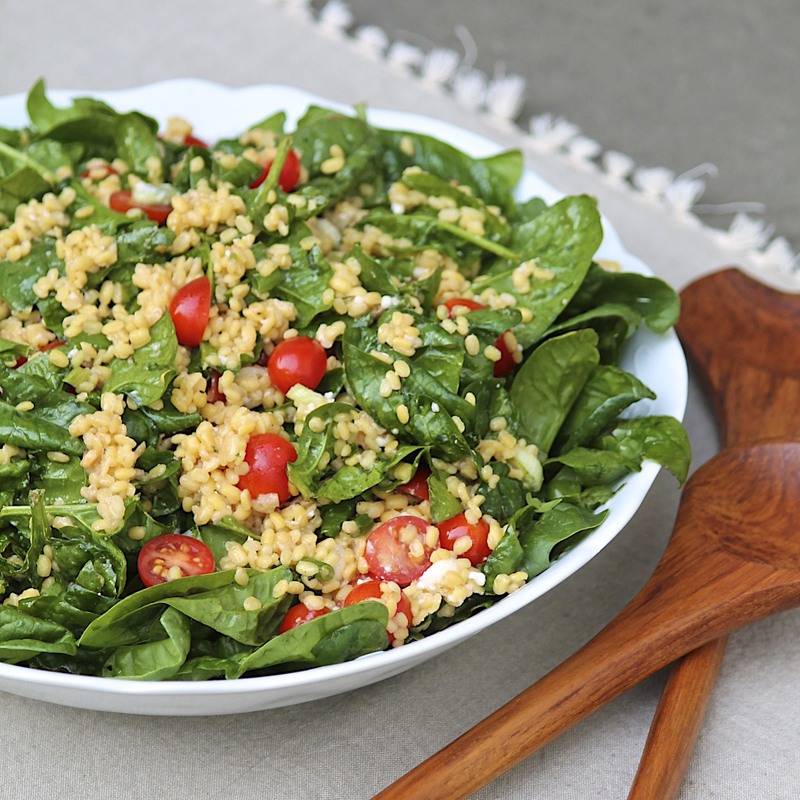 This salad is delicious as written, with the greens serving as an accent. Although one time, when I needed to feed more mouths than originally expected, I bolstered the salad by adding a bagful of mixed greens. It was an unexpected hit, and provided an easy way to “stretch” the ingredients. To visit Susquehanna Style magazine and see more of my recipes featured in this month’s Greens and Grains recipe box, click here. And I hope this salad makes your list of favorites, too! 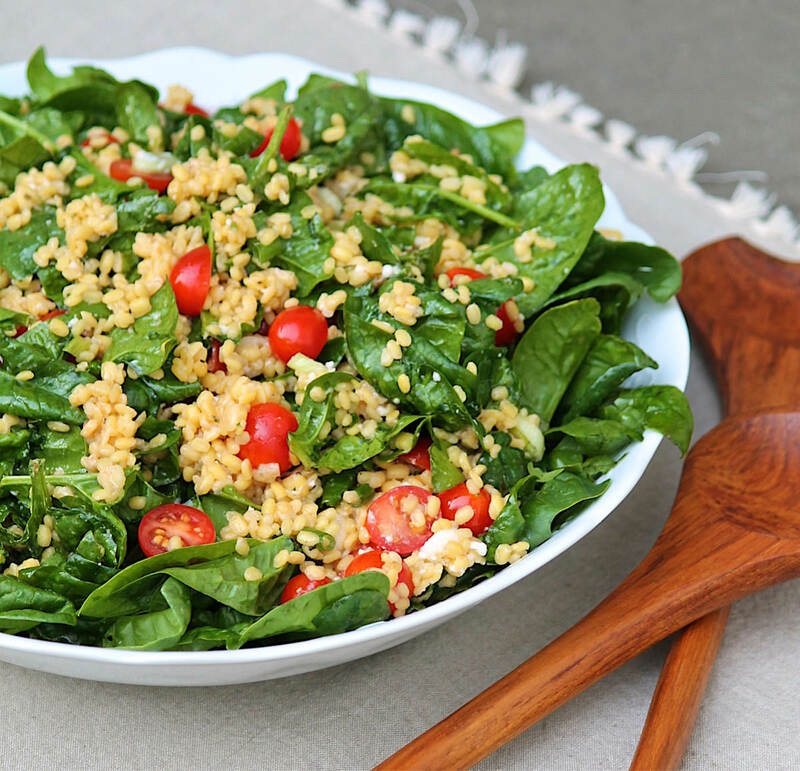 This flavorful salad is filling yet so very healthy. 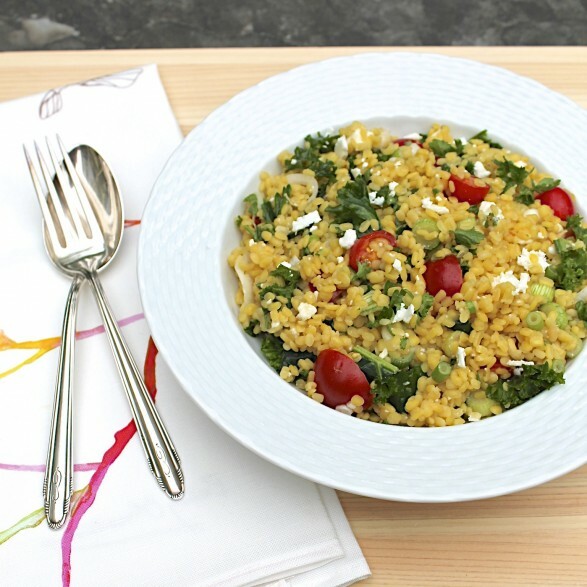 Yellow lentils offer beautiful color, a quick cooking time, and a slightly nutty flavor. Brown or green lentils may be used instead and will cook in approximately 20 minutes. For added ease, the lentils may be prepared 1-2 days in advance and refrigerated; the dressing may also be made in advance and will keep several weeks in the refrigerator. Yields 4-6 servings; 1 cup dressing. Mix all the ingredients except the oil in a small bowl (a 2-cup capacity glass measuring cup works well). Drizzle the oil into the bowl in a slow stream, whisking continuously. Conversely, you can mix all ingredients in a jar and shake vigorously until emulsified. Store, covered, in the refrigerator. The dressing will keep for at least two weeks. Bring three cups of water to a boil in a medium saucepan. Add the lentils and 2 teaspoons salt. (Much of the salt will be drained with the water after cooking but will provide added flavor to the lentils.) Stir, reduce heat to low to medium-low, and allow the lentils to simmer, uncovered, for 11 minutes or until cooked but still a little firm. I recommend taste testing. You want them cooked but not mushy. Drain thoroughly. Return the lentils to the pot in which you cooked them. If they are still a little wet, turn the burner on for a minute, stirring until the lentils are almost dry. Add 1/4 cup of the dressing to the warm lentils and toss. Stir in the greens, tomatoes, scallions, and feta. Toss until thoroughly combined, adding another drizzle of the dressing if desired. Serve warm or at room temperature. If you prefer the salad warm, you may make the salad up to two hours in advance, allow to sit at room temperature, and gently re-warm for a few minutes on the stovetop in the pot in which you prepared it. Refrigerate any leftovers. They are delicious the next day. 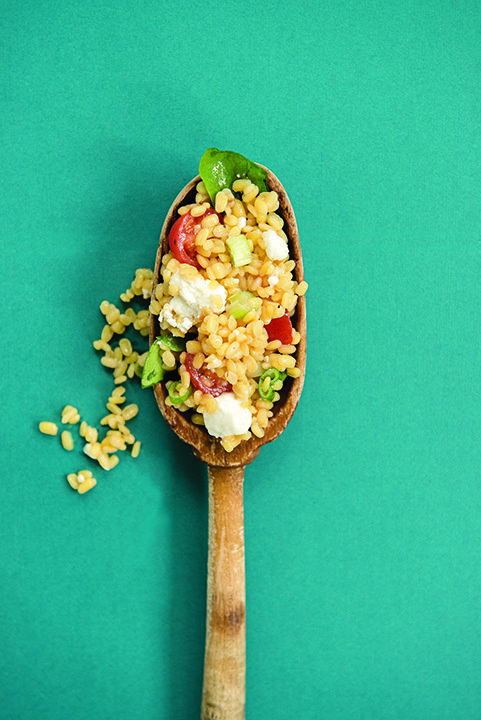 To turn this into more of a green salad (as in the photo above), simply add the lentil mixture to a bowlful of spinach or mixed greens and drizzle with additional vinaigrette. This photo, taken by Donovan Witmer, is the photo used in the January 2014 feature in Susquehanna Style magazine. To see more photography by Donovan, click on the photo. This recipe was shared with Lamberts Lately Create it Thursday and Moonlight & Mason Jars. The dressing on this salad is nothing short of incredible. I looked for the yellow lentils and found them. I’ve always enjoyed regular lentils but the yellow ones do have a great flavor and texture and are so quick cooking too. Great recipe!